Welcome to our Ischia blog, Good Morning Ischia! Here you can see the entry for Saturday 21st December 2013. It's a beautiful start not just to the day but to the new season as winter officially begins today. The skies are clear and the sun is already shining out to sea while those of us onder cover of the mountain have to wait just a little while longer. The moon is also visible and is almost full apart from a little bit at the edge which seems to have fallen off but I'd like to think that's some kind of optical illusion, let's hope so anyway! Temperatures today could reach as high as 16° Celcius (60° fahrenheit) with a minimum of 12°C (54°F) later on. 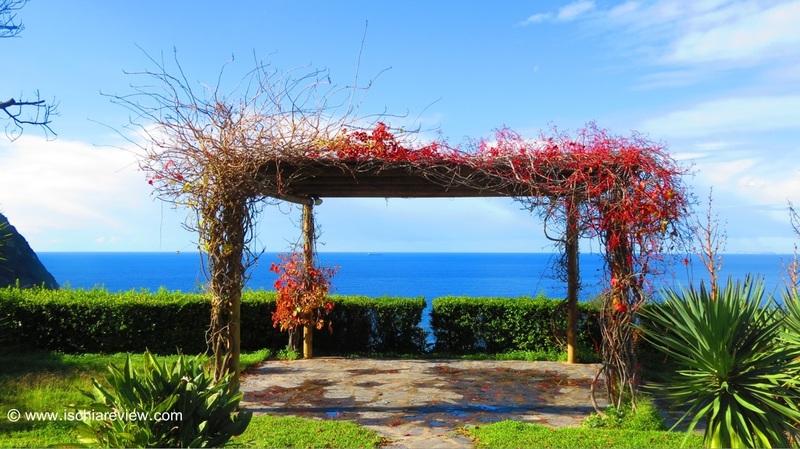 Today's photo comes from a villa overlooking the bay of Citara and shows the changing scenery of the season as the bright red autumnal leaves on the shrub that covers the gazebo gradually start to wither away and die before their regeneration next spring. On a bright day like today the sea remains a lovely azure colour with the changing tides creating little patches of blue shades where the water is slightly shallower. The 21st December also marks the winter solstice and this is the very shortest day of the year in terms of daylight, on each day after today we'll gradually see a minute or two more each day until we reach the summer solstice on the 21st June, six months from today. I should at this point mention an important event, on the 23rd December Castello Aragonese will receive a festive nocturnal makeover with some illuminations, an installation by Marco Nereo Rotelli which will last until the 2nd January. The lights will first come on at 9:30pm on Monday and then every day after that at 6pm. I'm greatly looking forward to seeing how that looks and will of course bring you a photo or two in due course. Ok that's all from me on this shortest of days, enjoy the sunshine and the weekend, I'll be back tomorrow morning with some more.